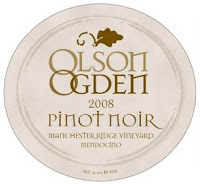 Olson Ogden Wines is a small producer located in the Russian River Valley of Sonoma County (California) that focuses on Pinot Noir and Rhone varietal wines. Last fall I had a chance to taste through Olson Ogden's 2008 line-up. I thought most of the wines were outstanding and rated some as high as 92/93 points. They just released a batch of 2008's which includes the introduction of some new wines in their portfolio. A interesting "kitchen sink" blend (69% syrah, 12% pinot noir, 13% grenache, 6% marsanne) that aims for approachability. Succeeds in delivering bright aromatics and substantial flavor. Red raspberries on the nose accompanied intriguingly by some pink grapefruit notes with a surprisingly long finish. The Manchester Ridge Vineyard is 3 miles from the Pacific Ocean in the Mendocino Ridge AVA 2,000 feet above Anderson Valley. I was curious whether this wine might be affected by the not-so-distant wildfire smoke taint that was said to affect some grapes grown in Anderson Valley in 2008 but I didn't detect smoke in the finished product. "The Manchester Ridge Vineyard was not affected by the smoke issues in 2008. Andersen Valley was especially hard hit by smoke but Manchester Ridge is just outside that appellation fortunately and was spared from a lot of the smoke from the forest fires. We were fortunate that none of our 2008 wines appear to have been affected. It was a tough vintage for growers and winemakers due to what mother nature threw at us but we are very pleased with the results." Clear ruby red with auburn highlights on this one. Initially, bright strawberries on the nose but after some time toasted marshmallow aromas come forward. On the palate a really enjoyable combination of slightly sharp acidity that is softened by the toasty aromas and flavors. Some tobacco notes. A finish that goes on for a mile. A big flavorful wine. Hotter at times than it's relatively reasonable 14.2% alcohol level would lead you to expect, but perhaps it will settle down with time. Legit Pinot. Named for John Ogden's wife Margaret, a non-red wine drinker who hass been lobbying for a white wine for years, this is Olson Ogden's first Rhone white wine. Marsanne is one of the grapes used in white wines from Hermitage and Chateauneuf-du-Pape. This wine offers a stunning onslaught of delicious perfectly ripe pear aromas. As it comes to room temperature, vanilla and baking spices are are revealed. Depending on the mood you're in, this wine could really hit the spot. Not necessarily what I'd consider a summer deck party wine but a white wine to drink indoors on a cooler night. Freakin' delicious. Samples for review. If you'd like to submit wine for review on this site please click here. Interested in reading more about these wines?